The CWM362 is a two-way in-wall loudspeaker. Like the in-ceiling models in the series it features an elegant minimal-width border design. 1x 6" polypropylene cone bass/midrange. Drive units. Frequency range (-6dB): 50Hz - 30kHz. *MINT* Bowers & Wilkins HTM62 S2 Dual 5" 2-Way Center-Channel Speaker. Condition is Used. Shipped with USPS Priority Mail. Bowers & Wilkins A5 WiFi Wireless Music System with AirPlay . Condition is Used. Original packaging and manuals included. This speaker is in good condition and has been lightly used. The unit can still be operated via the buttons on it or via Airplay. Condition is Used. Excellent condition. Very little use. Portable Bluetooth speaker by Bowers and Wilkins. Powerful sound in a small design. Rated at 100w max @ 8ohm. All speakers available work and sound great. This is a used working B&W M1 tweeter.18199. The ISW-3 is an incredibly versatile and compact in-wall and in-ceiling subwoofer. Frequency range: -6dB at 21Hz and 222Hz adjustable (EQ at A). Drive units: 2x 165mm (6.5") paper/Kevlar cone. Product ID #: ISW3. There is dented tweeter, but there is no hole or tear. This is for: 01 B&W CM center speaker. This speaker is tested working perfect. 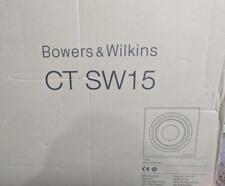 Bowers & Wilkins - 5" 2-Way In-Wall Speakers - CWM652 (Pair) - New! - Open Box! Bowers & Wilkins - 5" 2-Way In-Wall Speakers - CWM652 (Pair). Infinite baffle enclosure creates a sturdy design. We are here for you! We strive for you to have a "Goldstar" experience start to finish! This is a used working B&W M1 Speaker internal speaker. Bower And Wilking Z2 Wireless Speaker - White. BOWERS & WILKINS Z2 AirPlay Streaming Wireless Speaker - WHITE. This is sale for A B&W, Bowers Wilkins LCR600 Bass Unit / Grey woofer. Part Number: SKU: ZZ12858. Bowers Wilkins LCR600. 6.5" Kevlar Cone Woofer. Surround, Spider and voice coils are good shape. This Bowers & Wilkins CCM663 in-ceiling speaker features a 6" woven Aramid fiber woofer cone and Nautilus swirl-loaded tweeter design for powerful sound. 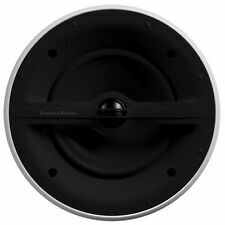 Bowers & Wilkins - 6" 2-Way In-Ceiling Speaker (Each) - White. Up for sale PRE-OWNED BOWERS & WILKINS A5 WIRELESS MUSIC SPEAKER (BLACK). Two-way, reflex-loaded, stand-mounted loudspeaker. These speakers have been previously owned and are in good condition. What is the history of the item?. We test them and picture their current condition. Bowers & Wilkins CWM7.5 2-Way In-Wall System Speaker (Single). You should not use this information as self-diagnosis or for treating a health problem or disease. Depth behind surface: 4". Frequency range (-6dB): 49Hz - 28Hz. Bring studio-quality sound to your living room with thispair of Bowers & Wilkins 702 S2 floor speakers. The 702 S2 is often regarded by audiophiles as the premier speaker option in its class. You will likely receive a response in minutes. The speakers is in great condition and fully functional . The driver is in perfect condition. See pictures for details. Part Number: SKU: LF01789. This is sale for A B&W, Bowers Wilkins 683 Bass Unit / woofer. Bowers Wilkins 683 Speaker. Surround, Spider and voice coils are excellent shape. 6.5"Aluminum/ Paper /Kevlar Cone. 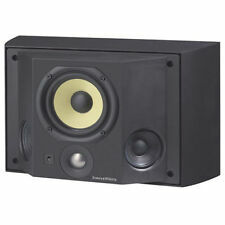 Bowers & Wilkins - 5" 2-Way In-Wall Speakers (Pair) - Black. Bowers & Wilkins 5" 2-Way In-Wall Speakers (Pair). 5" Aramid fiber bass/midrange cone. Infinite baffle enclosure. Allow simple, secure connectivity. In good Condition Just showing minor signs of prior use. Model: HTM62. We are willing to work out any problems or concerns you have. This is for: 01 B&W FPM6 speaker. This speaker is listed as used, but it is in like new condition. Bought it new, and never installed it. Driver has been tested working and is guaranteed fully functional. Item has wear from previous use including scuffs and scratches. Photos of actual item for sale. Item is on hand and ready to ship. Please feel free to message us if you have any questions. Bower & Wilkins B&W Center Channel Black Speaker. This speaker is in great working condition,has been tested. Tested,great sound. Pair 1989 B & W Speakers BN 2001 Mid Range Woofer DM 580 500 Series. Pulled from a DM580 I think they will fit other models as well. They work great. One 4" woven glass fiber woofer cone. Enclosure Type: Ported. Tweeter Material: Aluminum. Headphone Jack: false. Conducts power through the speaker. Woofer Material: Glass. Speaker Type: Bookshelf. Speaker Wire Included: false. NO REMOTE, WORKS GREAT, AMAZING SOUND. GENUINE Bowers & Wilkins - CM8 S2 Dual 5" 3-Way Floorstanding Speaker (Each) - Satin White - 2436CL. The CM8 is just the right size for many of us urban dwellers living in smaller spaces. Small towers promise the imaging of a good stand mount with better bass extension. Works great!! Listing is for what you see in picture. Expect some kind of wear from use and age. For sale is a gently used Bowers & Wilkins LCR600 S3 Center Channel/Front 2.5-Way Speaker in Black Ash Finish. Made in England. I have owned this since 2005. It is flexible speaker designed to be used either horizontally or vertically, so you can either use it as a center, buy two for a Left/Right setup, or arrange 3 of them as Left/Right/Center channels (hence the LCR in the model number).